This sign warns of serious injury, damage to property and potential death. Before operating, please read the following “Safety Precautions” carefully. · Installation should be carried out by qualified personnel with close reference to the instruction manual and compliance to the local authority. · This appliance must be installed indoor only. 1. Remove the screws in order to remove the cover. Gently lift up the cover. 2. 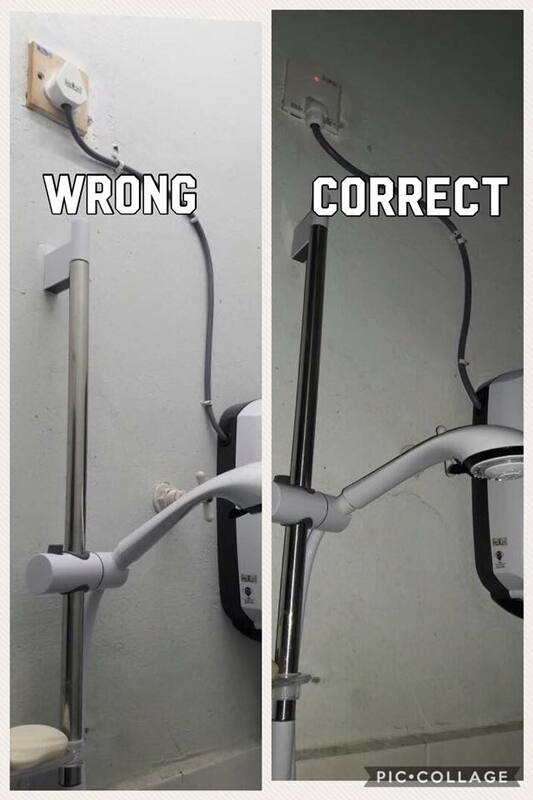 Select a suitable position in the bathroom, mark the screw points on the wall with the heater base and screw points for the slider bar / wall bracket. · The heater position should be at minimum 1.5m from the bathroom floor and must be in a vertical position. · For direct connection to the water tank, the heater must have a minimum of 1.0m (3.3ft) below the water tank. 3. Use Ø5mm drill and make the wall plug holes to 25mm depth. Insert the wall plugs. 4. Mount the heater firmly into position with the screws. 1. Screw the double rail slider to the position D & E. Follow the JOVEN logo to determine the correct double rail slider position. 2. Insert the slider plug to conceal the screw holes. 3. To adjust the slider bracket to your desired height, just press the PRESS button to slide it up or down. 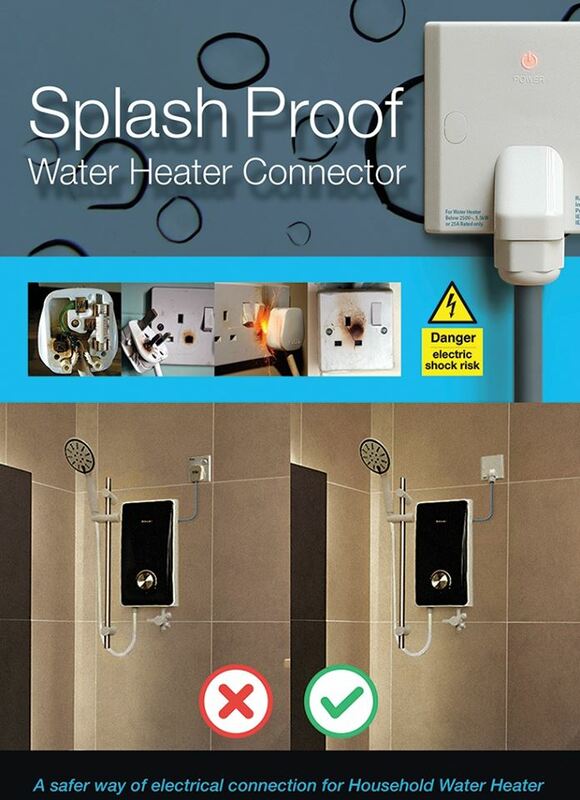 · This heater is a single point system and heater outlet can only be fitted to the PVC hose and hand shower set provided. No control valve or fittings can be fitted to the water outlet. · Metallic / chromed hose and conductive control valve shall not be used. 1. Connect SF / FCF valve to the water inlet by tighten the plastic nut & washer. Make sure the arrow facing upwards. 2. Connect the incoming water plumbing end to SF / FCF valve (1/2” BSP). 3. Turn on the water supply and SF / FCF valve to maximum volume to allow water flow into heater tank and drain out any plumbing particles through the outlet. Turn off the SF valve. 4. Connect the PVC hose to the water heater outlet and the hand shower. Be sure to insert the washers to the outlet connection and the hand shower, otherwise water will leak at the connector ends. 5. 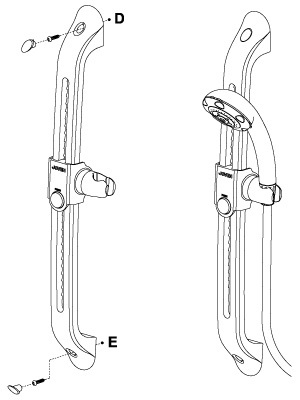 Hook the hand shower to the hand shower holder and adjust to your ideal position. 6. Turn on the SF / FCF valve & check for any water leakage. · All plumbing works must be completed and heater tank filled with water before proceeding to electrical connections. This will prevent any damage to the appliance. 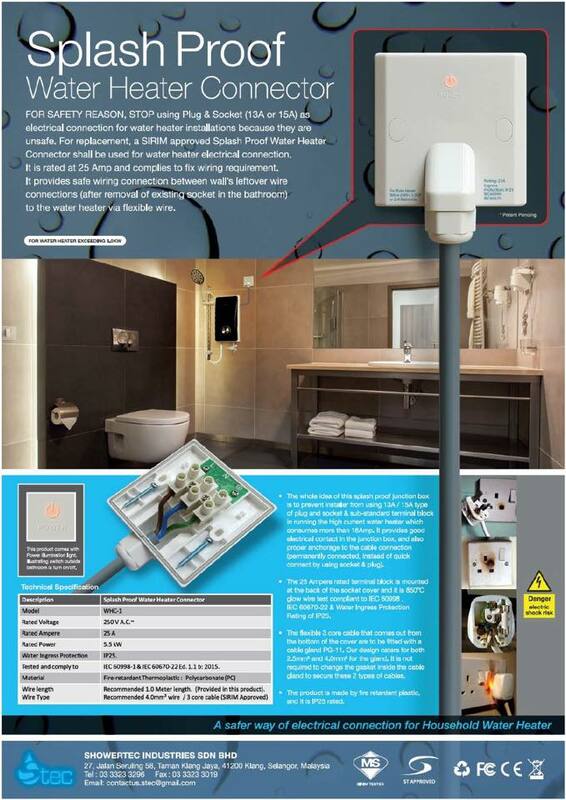 · Ensure that the electrical supply is single-phase at 220 to 240 Va.c. · This appliance must be permanently earthed. The use of Plug & Socket is not recommended. · It is recommended to install an approved current operated type Earth Leakage Circuit Breaker (ELCB) or Residual Current Circuit Breaker (RCCB) of 10mA sensitivity and higher than rated current (Refer to table). · It is recommended to install an approved type Miniature Circuit Breaker (MCB) or Molded Case Circuit Breaker (MCCB) of higher than appliance rated current (Refer to table). · Ensure that the wiring can supply the necessary amperage (Refer to table). · This appliance must be permanently connected to the electrical supply through a Double Pole Linked Switch above rated current (Refer to table) and having contact separation of at least 3mm in all poles incorporated in the fixed wiring. The switch must be out of reach from user in the bathroom. · Do not share the electrical supply with other appliances. 1. Switch off the electrical mains. 2. 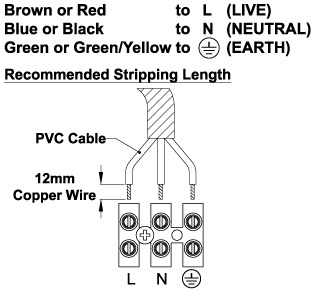 Refer to table for correct cable size. 3. Insert the cable through side entry or wall embedded cable by cutting a hole through the wire grommet or breaking the “Knock Out” point at heater base. 5. Check that the wiring connection is correct and properly tightened. · Make sure the heater tank is filled with water before switching on the electrical supply. Failure to do so will damage the appliance and void the warranty. · This appliance is not intended for use by young children or infirm persons without supervision. · Do not switch on if there is a possibility that the water in the heater is frozen. · This appliance must be switched off after use. 1. Switch on the electrical supply. Green POWER / EELS light will turn on. 2. Turn on the SF Valve in counter clockwise direction and water will flow through the hand shower. 3. For hot shower, turn on the temperature control knob. Red HEATER light will turn on. Adjust the temperature knob for comfortable shower temperature. 4. For model with pump, the booster pump starts automatically when the SF valve is turned on. The pump boosts the outlet water flow to provide an optimum invigorating hot shower. There is an additional pump on / off button located on the right hand side of heater casing is to enable the pump to be switch off wherever the shower pressure is sufficient. 5. If shower not hot enough, then you may require to reduce the flow by SF / FCF valve. 6. After shower, turn off the SF valve and switch off the electrical power supply.